Quick Moments: Could it be a Romantic Gift? Could it be a Romantic Gift? What would you do if husband, or loved one presented you with a crystal clad 1 gig USB drive? It's a real possibility as Philips and Swarovski are collaborating to bring stylish USB drives to market. I don't dislike the idea but am hesitant about whether I'd want to receive one for a valentine's gift. Is it possible to receive techno-gadgets as romantic gifts? I think it takes a little effort on the gift giver to really deliver on the romantic gift. How about if the USB key contained photographs from a special occasion, or a special message. What enhancements would you consider to make this a romantic gift to remember? What would the quick moment be if you had one of these? 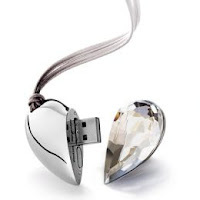 Enjoying the thought that dangling from your purse was not only an attractive accessory but when that moment arose when someone needed to transfer set of photos, a music file, a video from one machine to another you can whip out your usb crystal clad heart and save the moment. No doubt you'd have just had a manicure so the dazzling contrast between red painted nails and the silver would be striking and everyone around you would wish they were such a well put together woman! Moment over. Let's ignore the moment where it would be located at the bottom of your overstuffed purse with sticky candy, tissues, and old movie tickets. Look Whose Watching, or Rather Creating! What do Avon and Apple have in common? Is there time for luxury bags in your life?